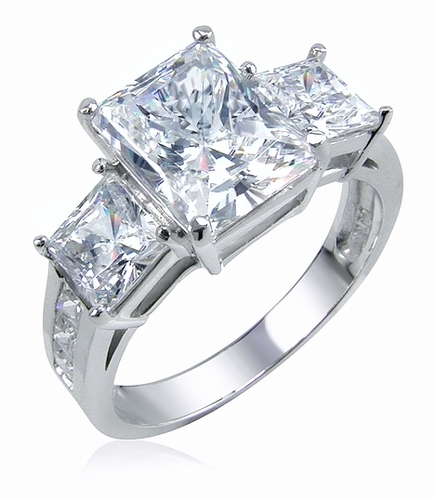 The Romero Three Stone Radiant Emerald Cut and Princess Cut Cubic Zirconia Engagement Ring is a three stone beauty that features a 2.5 carat 9x7mm radiant emerald cut center cubic zirconia with .75 carat 5mm princess cut on each side. 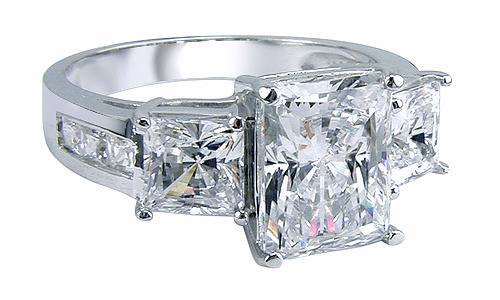 Additional channel set diamond look princess cut cubic zirconia further accent halfway down both sides of the shank. 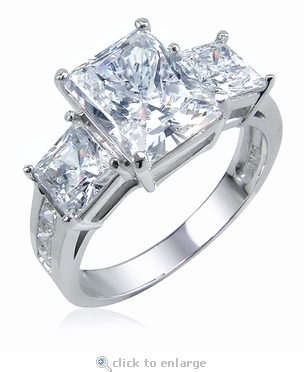 This three stone ring features the finest quality of hand cut and hand polished original Russian formula cubic zirconia. You can wear this elegant ring on its own or add a great complimentary wedding band to make a great eclectic wedding bridal set. The total carat weight on this ring is approximately 4.75 carats. The band measures approximately 4mm wide. The ring is pictured here in 14k white gold but it can be ordered in 14k yellow gold, 18k gold or Platinum via special order. Call us for a quote at 1-866-942-6663 or live chat with one of our fine cubic zirconia jewelry experts. Due to extremely low pricing, all clearance sales are final. This Clearance item may be sized for an additional fee of $35. Sizing below a 5 or above an 8 is subject to additional fees. Please call for a quote.